Current Affairs is a refreshing antidote to political media. It’s a beautiful publication full of satire, wit, and elegance. Current Affairs showcases some of the country’s best contemporary writers. Our magazine is informative, entertaining, and beautiful, and loaded with everything from book reviews to fake advertisements. We bring a sharp critical eye to the absurdities of modern American life, and provide a fresh set of voices amid the desiccated wasteland of contemporary media. 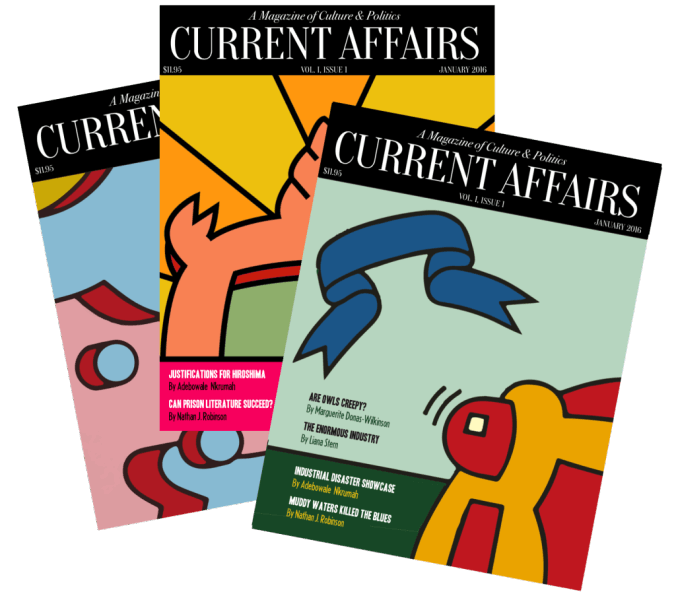 Current Affairs is published bimonthly as a print magazine, and mailed to subscribers. In addition, we offer a sample of our content free through our website. Get yourself a print subscription today; it’s $60 for six beautiful issues. We are a destination for those exasperated by clickbait journalism, and in search of something refreshingly frank, in-depth, and ruthless. We use the best writers, editors, and illustrators in the country, so that we may bring you a magazine of exceptional quality. Current Affairs is not a magazine like any other. It’s got plenty of top-notch writing about news, film, books, and ideas. But it’s also dazzlingly colorful, with satirical advertisements, subversive parodies of traditional media, puzzles, cut-outs, and an array of other unexpected amusements and surprises. It’s as if Christopher Hitchens and Willy Wonka edited a magazine together, or a gang of anarchist mimes raided the offices of the New Yorker. It’s as sophisticated as Vanity Fair or the Paris Review, but as exuberant and playful as Mad or Spy. But Current Affairs is not just about lively design and sharp satire. Our feature-length articles are substantive, serious, and beautifully written. They provide surprising new perspectives on topical issues, and offer engaging investigations into questions that are rarely asked. Current Affairs is committed above all to a quality reading experience. We want our pages to feel good, we want our magazine to look good, and we want our words to sound good. You might say that we’re the first magazine that actually cares about our readers. There will be no advertisements, no filler content, no lazy writing. We don’t do horse-race politics, we don’t do obscure academic jargon, and we don’t preach to the choir. You cannot go wrong with a subscription to Current Affairs. Receiving it in the post is almost certain to generate a burst of ecstatic joy, and a frenzied scramble to be the first in the family to get your claws on the new issue. Current Affairs is a bimonthly print magazine of politics and the arts. Each issue is crammed to the gills with insightful analysis and reporting, plus a dazzling array of artwork and suggestive advertising. Subscribers may find themselves harassing postmen, desperate for the sensory high that comes with the receipt of each new issue.